While we’re still in the midst of and nearly completed with our new Empordà-Costa Brava enotourism guide, we’ve also picked up a large number of tasting samples from from the Zagreb wine fair. We’ll be putting up tasting notes as well as rundowns of Croatian wine comparisons like “Zlatan Plenković, Entry vs. Top End”, “Crljenak Showdown”, and “Borgonja: It ain’t in France”. With four cases that all made it back safe and sound due to our “patented” traveling with wine system, there’s a lot to get through. We’ll also be putting some time in to an update of our Dalmatia enotourism guide, so keep an eye out for all of this. 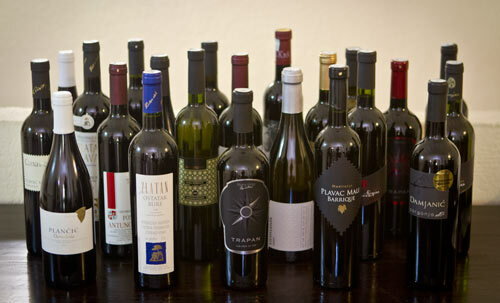 Delicious times to come from Vinologue HQ! Bonus points and a round on us in Barcelona to whomever can name the most wines in that photo above. And yes, you would be right if you were to say that a number of them are from Trapan. But, there is also one in that group that isn’t from Croatia. I won’t be a spoiler, cause it’s really not fair…but one of these things is not like the other…Sort of a tall fella. Looking forward to reading your notes!